The Central PA region hosts quite an event each year for the past 41 years. "This is without exaggeration the largest event of its kind on the planet. 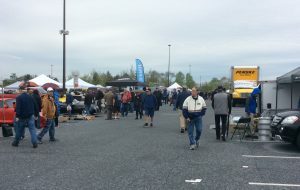 It typically brings nearly 650 vendors, around 1,000 Porsches, and over 6,000 visitors from all over the world together in Hershey every year. If you’re seeking an obscure Porsche or an obscure part for your Porsche, this is your best chance to find it. 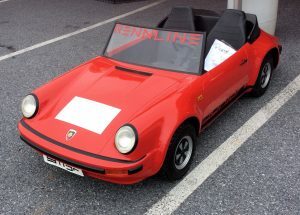 Every dealer and Porsche packrat in a 250-mile radius will be bringing their odds and ends for sale or swap. 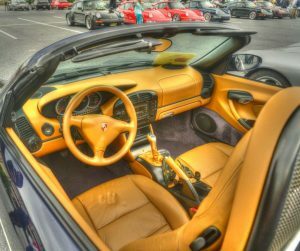 You’ll see exotic Porsches found nowhere this side of Stuttgart, and Porsche personalities ranging from PCA muckety-mucks to (sometimes) celebrities like Jerry Seinfeld. As always, we’ll feature a People’s Choice Concours, and Sunday autocross, too!" It's me again, the guy who will drive just about anywhere to enjoy my car, check out other cars, and the friendship of PCA members. 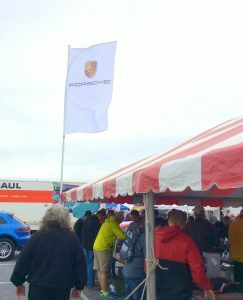 I decided to return again to this year's Porsche-Only Swap Meet at the Giant Center, Hershey, PA - the world's largest Porsche-only swap meet. The event is put on by our friends in the Central PA Region each April. It typically attracts over 1,000 Porsche cars, 6,000 people and 600+ vendors. 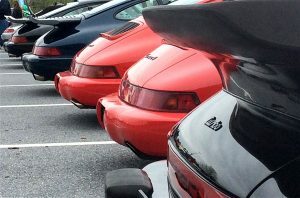 If you've never been before (and you can find another nice write up in the current eBrake newsletter by Damon Lowney - who takes many photos for the eBrake - here https://www.pca.org/news/2017-04-25/attending-largest-porsche-only-swap-meet-world), it is sort of a giant flea market/car sale/car show - of course all Porsche specific. 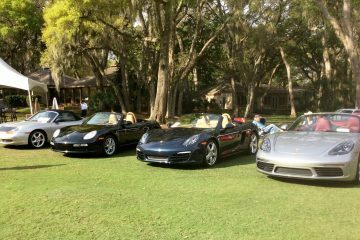 Known Porscheophile Jerry Seinfeld has been known to attend. I have family that lives about an hour and a half away, so I drove down Friday and stayed with them before the Saturday event. The swap meet goes on rain or shine and Saturday morning dawned will rain falling. I left around 6:30am to get there at 8:00 (gates open at 7:30). Parking is $20 and you can choose the general or Porsche-only sections. For another $20 you can put your car in the For Sale section. With over 1,000 cars there is a lot of eye candy, but also cars of every vintage and condition. Another $10 gets you registered in the People's Concours. I did this, not expecting any trophies, but to get preferred parking and a nice goodie bag. Plus it's nearer to the food trucks! Luckily, the skies cleared a bit by the time I arrived. 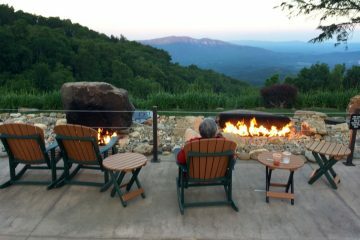 It really is an amazing place. 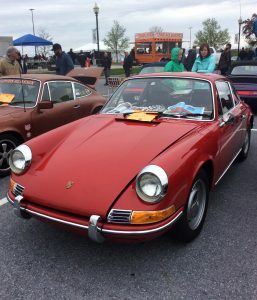 If you are looking for an original lighter for your 911 long body, seats for your 914, turn signal lenses for your 356C, a project car, a fully restored beauty or nearly any other thing - chances are someone is selling it at the swap. And nearly everyone is open to some healthy dickering. If you just want to walk around and ogle cars, or stand by the exit to hear the various exhaust notes as owners hit the road - this is the place for you. And like any other PCA event, you'll meet a whole bunch of interesting and friendly folks. I met the owners of Gramma Elsie's beautiful red 1969 912 (featured in last month's Pano). So great this car has -and will - stay in the same family. I ran into my friend from Virginia, Bruce Russell (right), who was there with a few friends scouring the aisles for hard to find treasures. 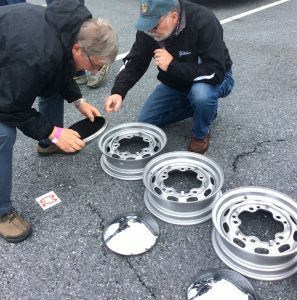 Here Bruce helps to examine a set of early 356 wheels and hubcaps. Of course, there is. Porsche tent offering a array of goodies for sale. 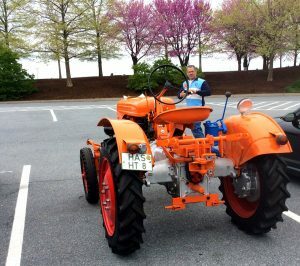 Then there are sights you just won't see anywhere else, including a Porsche tractor (there is no substitute, even on the farm). The front end plows a bit - understeer? Or planting? There was a car for the future enthusiasts too. 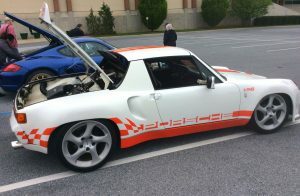 As well as someone who shoehorned a Chevy LS V8 into a 914. 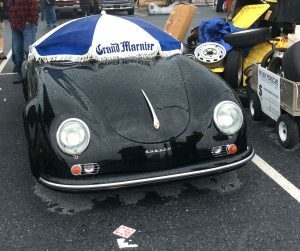 Sometimes the skies opened up, causing the masses to run for cover and the Speedster replica owner to get creative. The People's Concours had great representation across the classes. There were cars I would have sold my soul to the devil to own, including this stunning blue beauty. 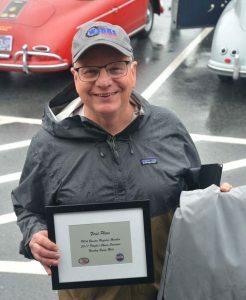 I was surprised to have been chosen for a minor award - the member of the Boxster Register special interest group whose car got the most votes in the Concours. Truth be told, there was just me and my friend John Novotnak and I think he rigged it for me. But, hey, first place is first place! John also took a glam shot of my interior. Just after the awards were given out, it really started to pour, so we all made our way home with purchases, goodies, awards and memories safely stowed away. It was another great day!